A baked finish results from baking paint onto a surface at temperatures exceeding 150 degrees Fahrenheit. Baking paint onto metal decreases the curing time of the object. This increases the production rate of painting when dealing with multiple objects, or when dealing with layered coats of differing colors. By baking your paint, you can reduce a paint job that would normally take days to complete—such as restoring a vintage model locomotive or painting miniatures—to only hours. No special ovens are necessary for baking the paint yourself. Even a toaster oven is suitable for use with parts small enough to fit. Apply a coating of metal primer to the surface of the metal you intend to paint. The primer creates an undercoating for the actual coat of paint so that the surface will have a consistent color and the paint will bind with the metal. The primer also aids in preventing rusting of the metal beneath the paint, adding life to your metal object. 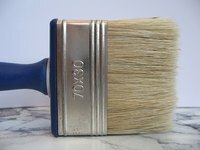 Brush the primer onto the surface using a paintbrush, building a solid coating from multiple layers. Place the primed metal into the oven on a flat aluminum baking sheet. Bake the primer into the metal at 150 degrees for about 20 minutes or until the primer dries. Baking times will vary according to the size of the object and the primer used. Consult the primer manufacturer’s instructions for recommended times. Turn off the oven and allow the metal to cool before removing it. Apply a layer of your bakeable paint. Enamel is a commonly used paint for baking to metal. Build up a consistent color coat as with your primer, brushing the paint on using thin layers until you reach the depth of color you desire. Place the metal back into the oven and bake at a temperature between 150 to 250 degrees, depending on the paint manufacturer’s instructions. Repeatedly check on the metal as it’s baking. Bubbles forming on the metal indicate that the temperature is too high and that you must lower it slightly. Turn off the oven once the paint has dried and allow the metal to cool. Remove the metal from the oven and examine the color coating. If you can see the primer through the baked paint, apply a second coating and then repeat the baking process, if not then your metal object is ready for use. Due to fumes and toxicity, never use an oven that is used for food preparation for baking on paint.